Last year, Brett and I discovered a faster way to get the ruby red jewels out of a pomegranate, thanks to Alton Brown’s Good Eats TV show. Brett has grown up with the alien-looking fruits, which are hard for me to hold in one hand. But trying to open them and get out the juice-surrounded seeds was a mess… we tried it once when we were dating. The little seeds burst, leaving my hands looking like a murderous red-stained character from MacBeth (in case you’re wondering which character: it’s Lady MacBeth, you geeky English nerds). But Alton showed us that the fruit could be scored on the outside and popped open under water in a big bowl. The little red seeds sink, while the white rind-like stuff floats to the top. No more red stains! No more mess. 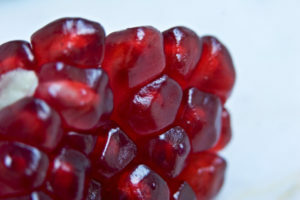 Plus it is a much faster method of getting to the anti-antioxidant goodness within the pomegranate. So last year, we ate about 24 of the giant fruits in a two month period. Healthy and good for you! This year, we’ve already started out strong downing 4 in a week. So we bought 6 more yesterday. I thought I’d spend a half an hour opening them up after lunch today. After what seemed like an eternity (2 hours), my feet were aching and my hands were cold. I had divested the seeds from 4 pomegranates… and I gave up on the last two. So our new under-water method is faster, but still not quite as fast as I’d like. But whatever it takes to get Brett to eat something healthy! perhaps you are being too careful??? The little darlings are hardy. My first one lasted for a good month in the frig after I freed the seeds.